Positive: High quality color reproduction and wide viewing angles of the display; decent performance for daily tasks. Gone are the days of limited affordable tablet options. The Acer Iconia W4-821 is a stylish, simple looking device which feels good in hand. The exterior comes in brush aluminium silver with a black front border. 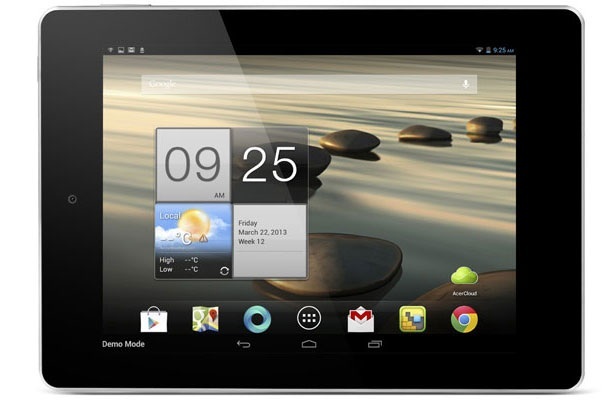 The rear panel panel of the tablet is only accented with the Acer logo and a camera at the upper left corner. Sporting a Windows 8.1 operating system, the Acer Iconia W4-821 brings fully fledged OS functionality in the user's hand. The hardware consists of an Intel Atom Z3740 quad core processor clocked at 1.33 GHz, 2 GB LPDDR3 RAM and an internal storage of 64 GB which is a nice size to start with. Despite the unusual huge storage capacity, Acer still provided an MicroSD card reader allowing huge amounts of portable data. The 8 inch Active Matrix TFT LCD display uses LED technology. An Intel HD Graphics controller with shared memory powers the display. Technologies packed in the Acer Iconia W4-821 include GPS, Bluetooth 4.0, and HDMI out. The 425 g device comes with a 2 cell Lithium Polymer battery rated at 4960 mAh, which provides a runtime of 8 hours. Z3740: Soc with an integrated quad core Atom processor clocked at up to 1.86 GHz (Turbo), an Intel HD Graphics GPU and a dual channel LPDDR3-1067 memory controller.» Further information can be found in our Comparison of Mobile Processsors.